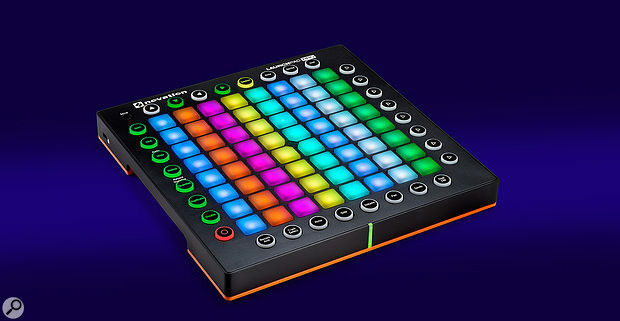 Novation’s popular Launchpad comes of age with the new Pro model. It’s no wonder that the Launchpad has been one of the most successful and recognisable music tech products of recent years. Its tactile control of Ableton Live, affordability and programmability has been loved by Live composers, DJs, hobbyists and hackers alike. I’ve come so close to buying one over the years (and dropped several birthday hints) but I never quite succumbed, even when they refreshed it with ‘S’ model; and even when the cute neoprene sleeve was killing me. Let’s start by rounding up what new goodness that ‘Pro’ badge gets you, before digging into the details. Firstly, the flagship Launch is more than a simple upgrade of the iconic 8x8 grid to velocity- and pressure-sensitive pads. Novation have taken full advantage of the hardware-focused functionality and APIs built into Live 9 to support Push, giving the Launchpad Pro many of the ‘beat workstation’-style workflows offered by Ableton’s controller. Also, the Launchpad Pro is not purely an Ableton peripheral. A well-featured stand-alone MIDI mode plays well with other software, and independent MIDI connections allow you to play hardware synths. (FL Studio and Bitwig users have also seen direct support for the Launchpad being incorporated into their DAWs of choice). The other ‘Pro’ distinction is that Novation have left parts of the Launchpad Pro’s firmware open, allowing third-party developers and hackers to create and upload a custom ‘app’ to the device to bend the Launchpad to their own desires. This could be huge, although it’s too early to tell how this possibility will be used. (See the ‘Secret Source’ box for more on this). The new Launchpad maintains the range’s ‘chuck it in your bag’ build quality, and now has a cool orange grippy rubber base. The Pro model is a couple of centimetres bigger on each side to accommodate extra button strips which now surround the pad grid on all sides. The buttons now have their functions printed directly on them on a black background, a simple change that makes them much more distinguishable from the performance pads. Another nice touch is a coloured LED strip on the front edge that indicates the device’s current mode. The Launchpad provided one of the slickest unboxing experiences I’ve had during a review. When used with a computer, power is provided by the USB port which features an extra-tight design to lock tightly onto your cable, making accidental disconnection close to impossible. (There’s also a Kensington Lock for when you need to prevent more intentional removal of your Launchpad.) Once connected, all I had to do was launch Live. That’s it. Live detected the new unit and automatically set it up in the MIDI Preferences. Regular Launchpads have a Mixer page to call up Track controls like Mute or Rec Arm, with the option to flip into Volume, Send or Pan modes. On the Pro, all these functions have spilled out onto their own dedicated buttons along the bottom of the panel. Tapping Record Arm, Track Select, Mute, Solo or Stop Clips steals the bottom row of pads for that function, with the rest of the pads in clip-launch mode. This reduces button presses, and makes it easy to see which track is which as the controls are overlaid on the clip columns. Switching to any of the continuous parameters (Volume, Pan or Sends) takes over the whole grid, using the pad columns as ‘virtual faders’. This we’ve seen on other Launchpads, but what’s new, and ingenious, is the use of velocity to control glide time between the current and new settings. Hit a pad hard and the parameter will be updated almost instantaneously; hit it softly and it will glide gracefully to its new level. This is realised in hardware: the Launchpad generates a smooth series of continuous controller messages so this feature will work with anything you’re connected to. So at this point we’re already talking about the best Launchpad yet, and we’ve barely got started. Alongside the Session mode button you’ll see the Note button. This turns your Launchpad Pro from a clip launcher into a MIDI instrument controller. There are different modes for controlling Drum Racks and other instruments; the mode is set automatically depending on which kind of device is on the armed track. 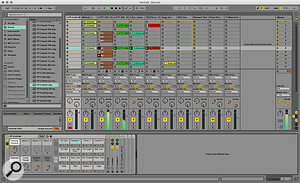 In Drum mode, the pads map to the Live drum device starting from the bottom left 16 pads. Any pads that have a sound light up yellow. All 64 pads are available for playing the Drum Rack, a much requested feature on the Push that has only recently been implemented. Anyone who’s had a bad experience trying to bank a 4x4 pad controller up and down a large Live Drum Rack is probably nodding appreciatively about now. The pads feel good to play, and are very solid and stable. They respond to a wide range of velocities, and the sensitivity level can be tweaked in the Settings page. I actually enjoy playing these smaller, closer pads more than traditional 4x4 grids. I was really happy with how the Drum Racks control has been implemented, although there was one issue that I encountered a fair bit: it’s quite easy to accidentally hit the mode buttons underneath the grid. When this happens it’s a show stopper because you get dumped into a new view, and you need to go back and re-enable Note mode. Maybe I’m just cack-handed, and I do like to play the kick drum pad with my thumb which probably doesn’t help, but I think Ableton maybe made the right choice not to put any buttons under the main grid. Switching to a different instrument track is simple: you just hold the dedicated Rec Arm button which will temporarily switch you to Session View. Tap the pad at the bottom of the track you want to play, then release Rec Arm and the Launchpad will snap back to Note mode. When playing anything that’s not a Drum Rack, Note mode maps MIDI notes to the pads starting at C1. A diatonic scale from the bottom pad is indicated by blue pads, and all octaves are purple. The notes don’t simply continue chromatically from one row to the next. Each row is one fourth higher than the one below, the same as the tuning on a guitar. This is very handy if you’re a guitar player as familiar chord shapes and scale patterns translate. The arrow keys transpose the notes by simply shifting the whole grid left or right, with the position of the Cs remaining indicated. Unlike some other pad controllers there are no alternative scale options, either for indication of scales or modes by colour, or for excluding notes that aren’t in key. Nor are there any auto-chord functions. While these features would be welcomed, Live users can simply drop in MIDI effect devices such as Scale and Chord (and Arpeggiator) to emulate some of these niceties. 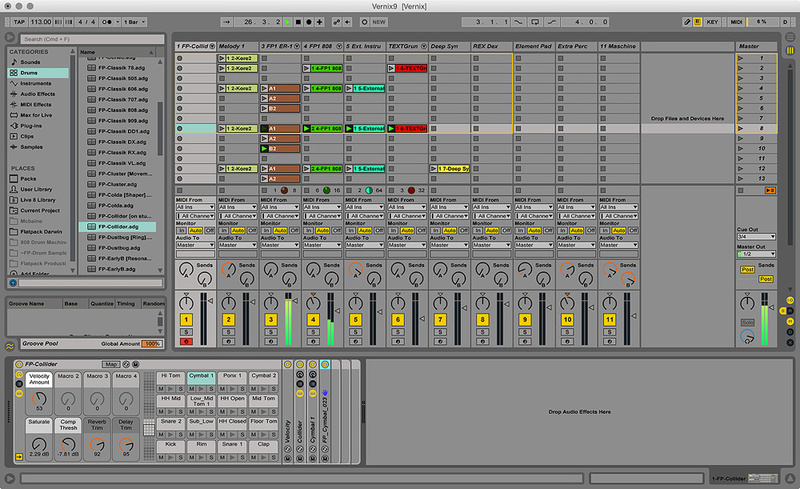 Ableton made a number of tweaks to Live 9 to create a smooth workflow for composing with Push, and thankfully they’ve made access to these available to other hardware manufacturers. Novation have done a great job integrating these features into the Launchpad Pro, elevating it from a pad controller to a full-fledged beat-production workstation. Functions for recording, duplicating, deleting and quantising clips are arranged down the left-hand side of the surface. As with Push, hitting the Session Record button will start a new clip recording on the armed track. You can also start recording a clip into a specific slot by holding Rec Arm and tapping a pad. Tapping record again will stop recording and start the new clip looping. You can overdub into the clip by hitting record again. Alternatively you hold Duplicate and tap to create a copy of the clip and start it playing. Subsequent overdubs will be directed to this clip. This is exactly the workflow that I like to use in Live, and which I’ve tried to emulate with keyboard commands for years. Having this on a single button push is heaven! Clips can be quantised and doubled with dedicated buttons, and Record Quantise can also be enabled from the hardware. The previous record pass can be scrapped with the Undo button, and a clip can be removed by holding Delete and tapping its pad. The Device button along the top row gives you a page for controlling the instruments and effects in your Live tracks, and also toggles the software between Clip and Device views. For any Rack-based device, Device view gives you control of the eight Top-level macro controls, via the same virtual fader system as mixer control. In other devices you’ll get control of eight pre-picked parameters. The Launchpad-controlling part of the Session, and a Drum Rack’s pads and macros.Device mode essentially takes the place of dedicated control knobs. As a MIDI instrument controller this is arguably the biggest thing missing on the Launchpad Pro, especially compared with other devices like Push or many stand-alone pad controllers. This rather limits your ability to tweak or modulate sounds while playing them. I’m pretty sure that Novation thought about this carefully and decided against knobs in favour of robustness, and possibly price. The limitation is mitigated in a couple of ways. First, I discovered that if you’re playing notes/drums in Note mode, you can keep them held while switching to Device mode. You can then make your parameter changes without interrupting the held notes. And thanks to momentary mode changing, you can just hold Device while tweaking, then let go and you’re back to playing notes. Another option is to extend your physical control options by adding a companion device like the LaunchControl or LaunchControl XL. This will give you some knobs. One thing I investigated was the possibility of pairing the two devices so that track banking could be linked, or that selecting/arming a track on the Launchpad would focus it on the LaunchControl. This functionality is not available by default, but Novation did point me to a great company called Isotonik who’ve developed Max patches that provide this kind of functionality, as well as lots of other cool stuff. Just in case it’s not clear yet, I love the Launchpad Pro. It gives me exactly the workflow I want in Live, and it also has stand-alone Drum, Note and User modes that mean I can use it in Reason and Pro Tools as well, not to mention with hardware synths. It might not have all the deep features and visual feedback of Push, but it does have very slick recording and composition workflows in addition to the new velocity-sensitive pads and traditional launch grid. What’s more, while I found Push initially confusing to get to grips with, I was up and running with Launchpad Pro in Live almost immediately. Eight onboard knobs would have been nice, and of course a step sequencer, but the latter may be taken care of by third-party enhancements — Launchpad Pro builds on the already impressive hackability of the Launch range. When asked about comparisons with Push, Novation’s messaging really focuses on distinguishing the Launchpad Pro as a performance device. If anything this rather sells the Launchpad’s excellent studio production abilities short, but I see their point: in terms of robustness, mobility and speed of operation, it’s about as good as it gets. Can I get two? Inevitably we need to talk about Push at some point in this review, but depending on what you need to achieve it’s not the only alternative to the Launchpad Pro. If you’re mainly looking for a Live clip launcher, then you should also consider the other Launchpad models, as well as Akai’s APCs. If it’s mainly a MIDI pad controller you need, then there are many other options, including Akai’s new MPD range, some of which have faders, knobs and a step sequencer. But for an all-round Live controller that can launch clips, play instruments and control mixer and device parameters, it’s going to come down to the Launchpad or Ableton’s own Push. (Although don’t rule out Livid). So how do they compare? Clip and Scene launching are much the same between the two, they both offer pad modes for drum rack and other instruments, and they both include controls for composition workflows. All of this Launchpad does impeccably, but Push’s Live feature set is richer. Push’s knobs and displays not only give you persistent, touch-sensitive control of devices with parameter names on the surface, they are also used for browsing and loading sounds which is outside the scope of Launchpad. There are many dedicated controls for Live functions, a touch strip performance controller, and of course the built-in step-sequencing interface. On the other hand the Launchpad Pro is significantly cheaper, is very easy to learn and use, and is about as robust and portable as you could get. It also has genuine stand-alone functionality, and if some developers take up the challenge to hack the open-source firmware it could start to be a very interesting platform. If this aspect intrigues you then check out the Monome, but you’ll need much deeper pockets. Novation are clearly aware of how many people have taken the Launchpad and used it for unexpected things. Many enthusiasts have used the Launchpad in place of the more expensive Monome to create deep software controllers, performance surfaces, art installations, etc. Of particular note is the Light Show phenomenon. Thanks to the ability to light up the Launchpad’s pads with incoming MIDI data, many people have used Live sequences, Instrument Racks and MIDI Effects to create light displays that can either be played back or triggered from the pads. YouTube is full of these performances. 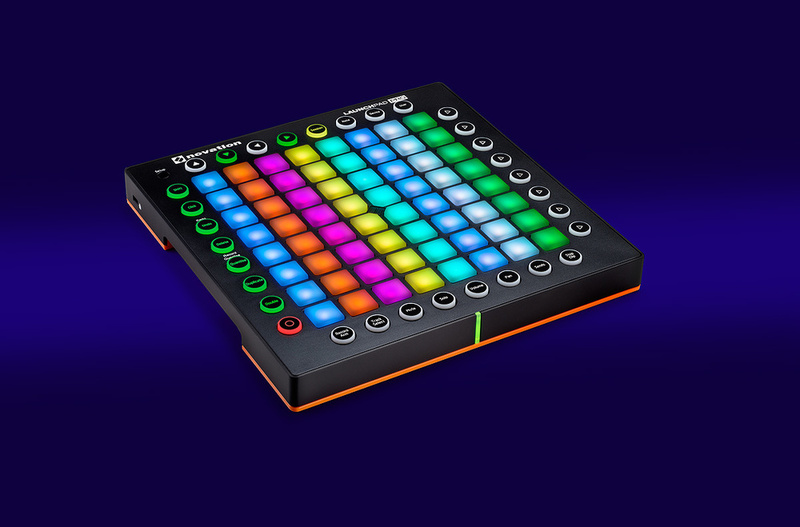 The colour palette of the new Launchpads is available from MIDI notes, or you can even use SysEx messages to send RGB colour blends and brightness commands to the pads — Novation say they’ve even had 25fps video playing on the grid! The level of control you can have over the Launchpads from external commands allows third parties to add rich Launchpad support to their software. Just as a few examples, software can remotely switch the device between Drum, Note and User modes, control pad colours and flash pads in time to MIDI clock. This has been used by mainstream apps like FL Studio and Bitwig, but can also be used by independent hackers or Max MSP programmers to give hardware integration with their creations. For example I’ve previously seen a Reason remote codec that let you visually program the ReDrum drum machine’s step sequencer from the Launchpad. It’s just a matter of time before we get some Max For Live devices that add animated sequencing and more. With the Pro, Novation have added another possibility for innovation from the third-party community. Areas of the firmware have been released as open source, and calls to lower levels of the hardware have been provided so that developers can upload their own code to the Launchpad Pro. This replaces the default Live feature set with whatever new functionality a determined C programmer can devise. Put more simply, you can upload ‘apps’ to the Launchpad. It’s early days and experimental at this point, but could be fascinating if it gets picked up, and right now has to be the hottest option for a university project. Ideally someone will make a friendly utility for managing and uploading people’s creations to the Launchpad. Some Mode buttons are a bit close to the performance pads. A Launchpad upgraded with full-colour, velocity-sensitive pads would have been great; but one with full Live production workflows and stand-alone operation is awesome.